I started in my kitchen with a basic recipe. I have known Ed "Chill Lee" Paetzel for about thirty years now. Ed was one of the heavy hitters in the chili cook-off world for quite a few years. He racked up an impressive list of victories, and his recipe has probably won as many chili cook-offs as any. JR (That's my initials in case you're wondering): What is your first memory or experience with chili? Ed (That's about as short for Ed as you can get): Having chili at James Coney Island at 2:00 in the morning in October, 1951. JR: What prompted you to enter your first chili cook-off? Ed: I struck up a friendship with Fred McMurry, who was one of the founders of the Torrid Texans, maybe the first chili team. Fred was also the first Great Pepper in the world and thought up most of the things that are now associated with Chili Pods. [Author's note: "Pod" refers to a club or organization devoted to chili cook-offs. Fred is now known as the "Grand Pepper," a title he deserves rightly. Fred and I entered the 1971 Texas State Men's Championship better known as Chilympiad. JR: How did you do? Ed: I think out of 39 cooks, give or take 30 or so, we came in last. JR: So what got you hooked on chili cook-offs? Ed: It was something to keep me off the streets. JR: How did you develop your recipe? Ed: This is true. I cooked chili every weekend for two years looking for a decent chili. I'd have my son Karl take a taste, and he'd always spit it out. In 1974 I cooked a chili he didn't spit out. I entered it at Chilympiad and won the cottonpicker. JR: Was that your first big win? Ed: Yes, my daughter Kim won the Junior State Championship that same weekend. It just doesn't get much better than that. JR: Didn't you enter some cook-offs before the 1974 Chilympiad? 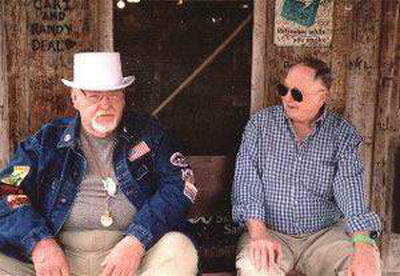 Ed: I cooked with Fred McMurry at the '71,'72 and '73 Chilympiads and at the first Houston Pod Cook-Off. Fred and I entered the first Marble Falls cook-off and got second place for driving the fartherest. Mary Griffin won. But then, it was her cook-off. In 1974 I formed my own team called "Chill Lee and the Jack Rabbit Riders". JR: What are your proudest accomplishments? Ed: Winning more than once at the two biggest cook-offs. I finished second at the Prairie Dog cook-off in 1976, and then won it in 1977, 1978 and 1979. I won Chilympiad in 1974 and 1979. Winning both Prairie Dog and Chilympiad in the same year was about as good as it gets. JR: When you started developing your own recipe, did you use a basic recipe or just make things up? Ed: I started in my kitchen with a basic recipe. I'd cut something here and add something there until I had the winner. JR: Was there a single ingredient or method that made your recipe a winner? Ed: Absolutely. New Mexico ground red chiles. That gave the chili its unique taste. My basic recipe and various offshoots of it had won over 250 cook-offs in the 70s when I stopped keeping count. JR: What cut of meat do you prefer for your chili? Ed: First place, it's got to be tender. I use strip steak, if I'm using cubes, and chili grind sirloin when I cook for a big crowd. JR: Do you prefer cubed or ground? Ed: When I first started cooking with McMurry we used hand cut sirloin. We would always hand cut it the night before the cook-off. We stayed up half the night cutting the meat into cubes. When I formed Chill Lee and the Jackrabbit Riders, I stayed with the cubes but used the strip steak. I don't remember ever using chili grind in competition. So there we have a few words of wisdom from a chili legend. Ed was nice enough to provide us with his recipe. Place cooking oil and garlic in your cooking pot at the same time. Turn on heat and brown garlic. When garlic is nicely browned remove it from the oil and discard. The cold oil absorbs the favor of the garlic as it cooks without being bitter. Brown the onion, and jalapeno. Brown the meat in same pot with onion and jalapeño.